Industrial and furniture designer responsible for the 32-story Pirelli Tower in Milan, along with Pier Luigi Nervi and Arturo Danusso; it was the city's second skyscraper. He served in World War I, earning the rank of Captain in the Pontonier Corps, from 1916 until 1918; he was awarded the Bronze Medal and the Italian Military Cross. He founded Domus magazine in 1928, which he edited until 1941. He then edited Stile magazine until 1947, returning to Domus in 1948. He was born to Enrico Ponti and Giovanne Rigone in Milan. 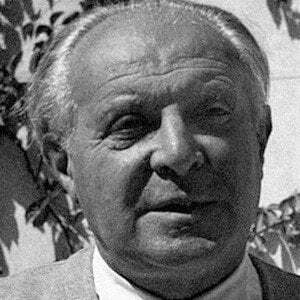 He married in 1921 to Giulia Vimercati and had four children. He was born in the same country as Leonardo da Vinci.